I'm really stuck for a few days! I am sending 256 bits looped from my PS. But I think that I get juste the last 4 bytes of 8*4 that i send ! What I want from you is a few vhdl code line that allow me to receive all of my data (8 * 32 bits). -- the transaction is a data access or an instruction access. -- valid write address and control information. -- to accept an address and associated control signals. -- bits of the write data bus. -- data and strobes are available. -- can accept the write data. -- of the write transaction. -- is signaling a valid write response. -- can accept a write response. -- transaction is a data access or an instruction access. -- is signaling valid read address and control information. -- ready to accept an address and associated control signals. -- signaling the required read data. -- accept the read data and response information. -- de-asserted when reset is low. -- expects no outstanding transactions. -- S_AXI_AWVALID and S_AXI_WVALID are valid. -- select byte enables of slave registers while writing. -- These registers are cleared when reset (active low) is applied. -- and the slave is ready to accept the write address and write data. -- when axi_wready, S_AXI_WVALID, axi_wready and S_AXI_WVALID are asserted. -- de-asserted when reset (active low) is asserted. -- asserted. axi_araddr is reset to zero on reset assertion. -- cleared to zero on reset (active low). -- and the slave is ready to accept the read address. Sigh. That's a lot of complex code there. I'm struggling to work through just understanding the logic. Perhaps it's late, and I should take another look Monday morning. Looking over your code above, I haven't spotted your bug. Neither have I managed to get a good handle on what you've got going on while trying to access the bus. The typical response at this point from the Digilent staff would be to point you to something that works. Let me point you at my own example AXI component. Maybe it will help. If you look through that, you'll find the fundamental AXI logic up at the top, and the more generic bus logic sprinkled through below. This turns the logic within the core into something closer to a core on a generic bus. This example core will also process one axi request per clock, so it's faster and simpler than what you've tried posting above. That said, let me try to help you out one better than either finding your bug via desk-checking (I'm too tired to see it right now) or offering you an example to compare your code against. Your problem isn't fundamentally the code you've posted above---even though that's what you've been wracking your brains against. The problem you are struggling with is more fundamental. It is your engineering process. 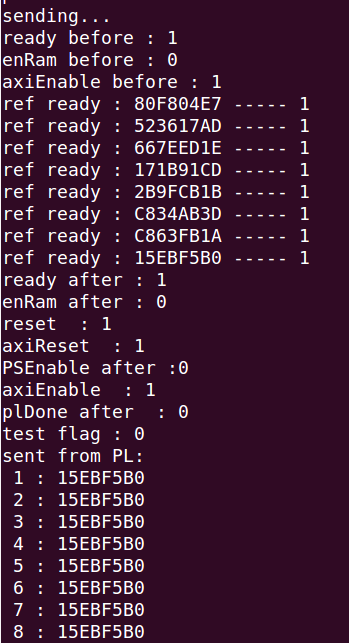 What you need to do first is to build your own AXI master ... not anything full up, but just enough to test your component, something that runs within a simulator. Then simulate your component. I wrote about what I'm trying to describe here, and the (verilog) tools I use to do it here. Further, there's also a description on the zipcpu.com web-site about how to get a trace from within your design on there as well. (You'll find the AXI scope I linked to you above a cheater's way of bypassing many of the difficulties the web-site works around.) The reason I point this out is that, it's a whole lot easier to debug a component within a simulation, than within your design. It's also easier to debug a component within your design if you can get a trace from within it showing you what's going on. Let me recommend to you that you switch to an easier method of looking for the bug in your code. Holler if any of that doesn't make sense, or if you still want me to take a hard look through your code on Monday morning. I thank you very much for your reply and for your advice. You are right to said for better manage and control this bus it is necessary to implement its own bus AXI but for reasons of time I can not do it. I looked at your implementation it looks interesting but it is in Verilog, I have modules implemented in VHDL, so to adapt them it will take me a little time. I generate it with Vivado it is a simple AXI lite slave. I'd like you to look at it in more detail. Thank you for your time. Ok, so I took a fresh look in the light. You've got a bunch of errors in there. They are all simple errors. Further, everything I saw would be revealed by a proper simulation (Consider ghdl and an AXI bus functional model as tools for this). I'll share with you the errors I saw below, but you need to understand that you are pushing off a problem (not knowing how to simulate this) for later. You will need to go back and learn how to simulate something like this if you wish to move forward in your digital logic journey. I'm sure you already know by now that an AXI bus has five channels within it. The indication that a transaction has taken (or literally is taking) place on the bus is that the READY and VALID lines for a particular channel will both be high at the same time. On *that* clock, the transaction takes place. It's not when VALID is true and you set READY, but when VALID and READY are both true. My point is, you cannot check, for example, whether VALID and READY on one channel are true *AND* anything else. You will lose transactions if you do this. Look for VALID AND READY. Any additional logic to this will ... get you in trouble. As examples, consider your axi_bvalid, axi_bresp, and your axi_rvalid signals. In particular, your approach to axi_bvalid could lock the bus ... since you'd allow a request to take place that would not get a response. The next big problem I saw had to deal with timing. A read needs to take place any time arready and arvalid are true. If you want to double check that axi_rvalid is false, you'll need to do it before setting arready. Hence, slv_reg_rden needs a touch of simplification. Keep in mind, though, from slv_reg_rden, you take two clocks to return a value to the bus, while setting axi_rvalid immediately on the second clock. Hence the two responses (axi_rvalid and axi_rdata) are not aligned. Again, a simulation would've revealed all of these problems, and it would've revealed them within about 15 minutes of working with it (once you know how to use it), rather than the days you've struggled with this problem. Another way you could debug this bus would be to change your axi_rdata output value to be information of the bus transaction taking place, rather than the values you want to get out. That method may be a touch harder to wrap your brain around (for me too), but I have used it in the past to get information from a system when I am unable to simulate it. I monitor the signals ready and valid that they are both to 1 when i receive data. You are monitoring signals? Good. How many and which signals are you able to monitor? Thanks for your reply, i will adapt it to my code.